Roofs absorb all the brunt from the cold winter weather. Therefore, it should be sturdy enough to withstand the harsh condition of winter with its ice and snow. In fact, cold weather demands special requirements for roof materials, design and maintenance. A strong and solid roof above give comfort to your family knowing that your home is safe. 1. Ice Dams. One of the common problems associated with cold weather is ice dam formation on the eaves. 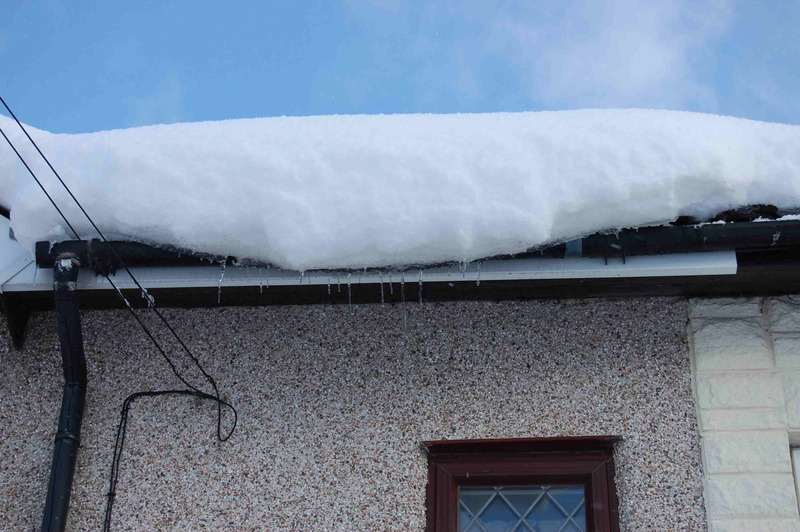 Heat from the roof melts snow, which runs down the roof to the eaves. Ice dam forms on the eaves if the water cools before draining from the roof. Large ice dams could damage the roofing, flashings, gutters, downspouts, roof drainage system, building structure and interior. Solution. Make sure there is sufficient insulation and ventilation on your attic. You can also install membrane underlayment below the roofing material to prevent water leaks to the house. 2. Obstructions on Downspouts. Dirt and debris could mix with ice and snow on your roof and eventually find their way down the gutter and downspout. These materials accumulate over time and could potentially block the downspout, preventing melting snow and ice from draining down to the ground. Solution. Regularly check the areas around the downspouts and clear away dirt and other debris that could block the passage. 3. Snow. Snow and ice formation on roofs is a common occurrence during winter season. Depending on the weather, the volume of snow could exceed the load-bearing capacity of your roof, posing a serious risk of collapse. Solution. A special tool called a roof rake, purposely created for this purpose, could be used to scrape off snow and ice accumulation on the roof. 4. Gutter Ice. Ice normally builds up in gutters during the cold winter months. If the buildup of ice becomes too heavy, your gutter could give in and totally rip away from your house. Solution. The solution is fairly easy. Just use chisel or hammer to chip away the ice formation. Be careful not to damage the gutter to avoid costly repairs. You could also call your local roofing contractor to make sure the work is properly done.